I believe other than our health, the relationships we most care about would also be a reliable measure of our cultivation towards becoming our God-Self. All intimate relationships serve as mirrors of our soul’s loving attributes, or our ego-based fears, or sometimes, both. Depending on how we choose to interpret them, we can either thrive or feel defeated in these heart-thug connections. By the way, all our interpretations are valid and true for us as the observer, as they are generated from our current level of spiritual awareness and based on the specific aspect(s) of the relationships we focus on. Quite often, we perceive and interact with our loved ones as the projections of our ego (incarnated personality). Accordingly, we tend to assess and conclude on these relationships from the ego’s dualistic perspective. On the contrary, if we were to understand and feel the vibrational flow between us and them – including our spouse, partner, children, parents, siblings, best friend, mentor etc – as extensions of our soul and expressions of our transcendental soul qualities, chances are we will begin to embrace and appreciate their company much more. Conflicts and misunderstandings, often manifested as reflections of the residual karma imprinted in our soul memory, can be resolved with less effort too. As we know, every new moon is a valuable opportunity for renewing or setting new intentions to experience greater expansion, growth and fulfillment in the coming lunar month. A Solar Eclipse New Moon would be one of the best times to reprogram lower-vibratory mental programs to give rise to a more evolved mindset about ourselves and our external realities. As shared by my guides, metaphysically, the Sun relates to the mind, whereas the Moon, our emotions. When we observe, or are aware, that the Sun is being partially or fully blocked, as in the case of a Solar Eclipse, our subconscious mind registers a void in itself (i.e. space of non-light), thus permitting new mental patterns to be programmed during this time. If it appeals to you, you may practise the following meditation at the coming New Moon Solar Eclipse to elevate the vibratory quality of your important relationships. The intended shift occurs by streaming through the I AM Presence of your Monadic (God) Self and anchoring it on your third eye chakra to effect an uplifted ‘perception’ (mental programming) of those relationships most symbolic of your soul attributes. 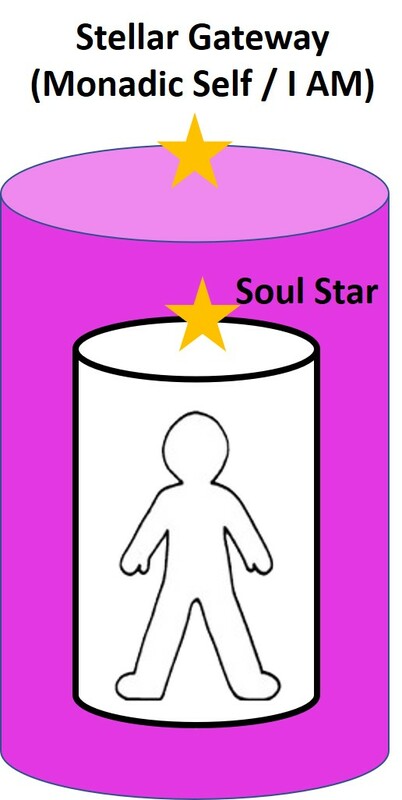 Have awareness of your Soul Star chakra (located about an arm’s length above your crown) as a brilliant star and create a cylinder of pure white light out of it, encasing you completely. Place your attention on a chakra located above the Soul Star (distance between the two chakras to be intuitively determined) and recognise it as the Stellar Gateway, calibrated with your Monadic Presence or I AM consciousness. Visualise the chakra expand into a cylinder of radiant violet light, containing you and your soul. Refer to diagram below. 3. Allow yourself to be merged with your soul (white radiance) and monad (violet light). 4. 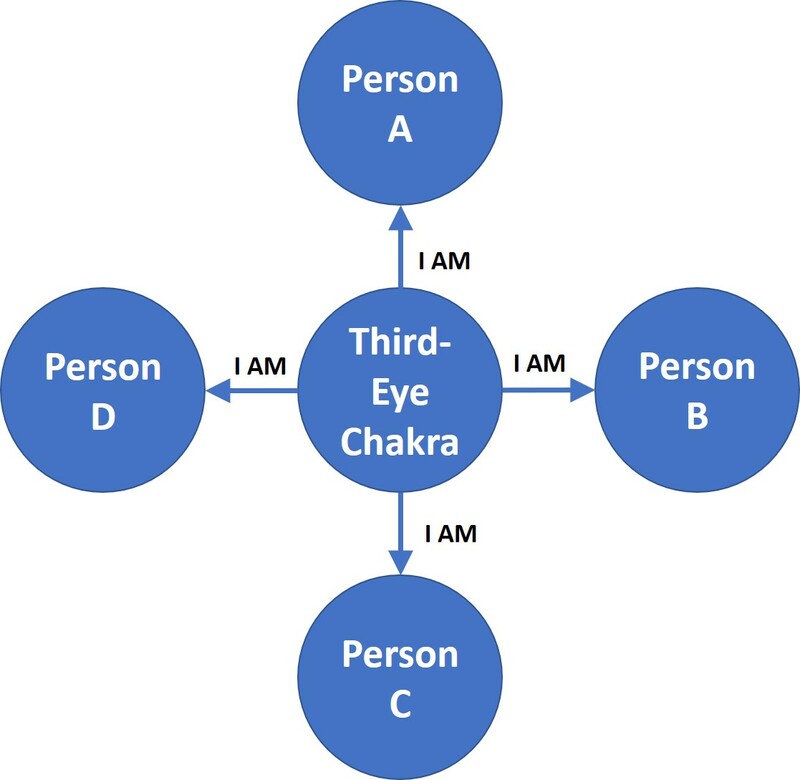 Focusing on your third eye chakra, begin to project the I AM Presence that is activated in your cells out to the people you’re most intimately associated with. Refer to diagram. 5. Emerge from meditation once you sense these vibrational projections have stabilised. Mastering our emotions is also key to creating and sustaining vibrationally powerful relationships. In fact, emotions self-mastery is essential for our soul ascension and actualising our multi-dimensional nature, so advised our guides from Sirius. To hear more of their ‘stellar’ insights, Andy and I would welcome you to join our next retreat in Byron Bay (Australia) 9 to 14 August, featuring a 2-day workshop on ‘Mastery of the Human Emotions‘. Read more at “Retreat: An Ocean of Blessings“. Email Andy at andy@acast.me to enquire or register. Only 3 places left. Wishing All a most invigorating New Moon and a soul-ful Valentine’s ! Blessings, Amara Tia Ann.